The concentration of CO2 in the atmosphere is at its highest since the past 650,000 years, says the US National Oceanic and Atmospheric Administration. 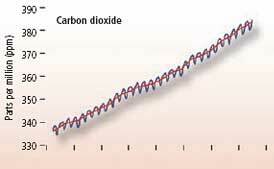 Between 1979 and 2007, the level of CO2, the primary driver of climate change, increased at an average rate of 1.65 parts per million. 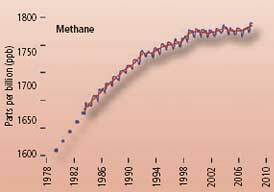 The growth rate of methane, however, declined since 1992 due to change in emissions. 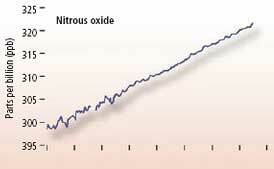 Over the past 29 years, nitrous oxide emissions continue to increase steadily, while the chloro fluoro carbons (CFCs) have reached a plateau since 1992. 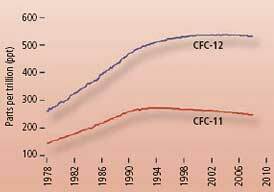 The decrease in CFC emissions is primarily because of the Montreal Protocol on substances that deplete the ozone layer.